Posted on 2/5/2019, 10:15 am, by rackycoo, under General Projects. 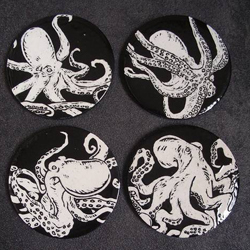 maxxev presented her octoposse in a lovely set of ceramic coasters. The graphic black and white make these octopuses really stand out. artsycandice made this beautiful batique octopus, and included a tutorial on how to make those delightfully bendy legs. 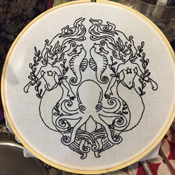 lindyv321 presents impeccable blackwork in this embroidery of sea life. Along with the octopus, there are sea horses, mermaids, and some flowy seaweed. 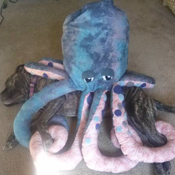 This large octopus by JoyfulClover is not only cuddly, but useful as well. How large is it? If you look closely you will see that is hugging a sleeping pup. 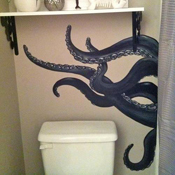 If you’re ever in FoxyBlue‘s house, be careful in the bathroom; there’s a kraken lurking in the shower. FoxyBlue also added other sea life to the decor, like an octopus towel holder and a great shark head. Make bathtime fun again! There are so many fish in the sea, and so many octopusses on Craftster. 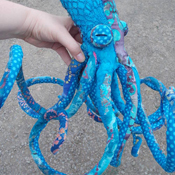 Click on the Craftster tag “octopus” to view more.